Hi, My name is Kristin Miller. I have been a stylist for 20 years. I am a blonde specialist. I am certified balayage artist. I am also certified in extensions and keratin smoothers. Keratin smoothers help to soften curl and wave to make your hair super easy to style for 4-6 months. I love doing vivid colors so I can make you a mermaid/unicorn. I am an innovative colorist no color is to much for me including corrective colors. 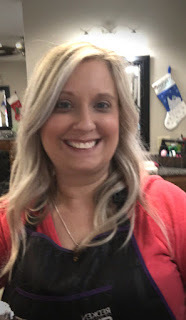 I also can take any picture you give me and give you the cut and color you are looking for. I do men, women, and kids cuts, colors, perms, smoothers, gentle relaxers, extensions, facial waxes, buzz fades, blondes, browns, Bronde and every color inbetween. If you are looking for a stylist I would love to have you in my chair.